Your car needs to be repaired, and you're wondering, how long will it take to fix? How much will it cost? Is there a chance that these factors change? These are all good questions to ask when it comes to auto repair. As you know, cars aren't just four wheels and a seat, they're a lot more than that, especially modern cars (say, anything built after 1990), which are more like rolling super computers rather than simple A-to-B transportation. The answers to these questions are unfortunately not always initially clear, which is understandably a source of confusion and frustration. Why is it going to cost more? Why is it going to take another 3 days? Who's paying for this? The truth is, nobody knows until the repairs get started and the damage is further investigated. First, your car is involved in some sort of collision that inflicts damage to it; the damage could be anywhere from extremely minor and purely cosmetic, to severe and requiring extensive repair that could involve frame, mechanical, and/or electrical damage. The next step would be to get the damage evaluated. An estimate will be written for the damage as seen from the outside of the car, without much disassembly of any of the car's components, and will be a close approximation of how much it will cost and how long it will take. Notice we said it's a close approximation; this comes back to cars being rolling super computers made of a thousands and thousands of individual pieces. After the car is disassembled, any number of things could arise that were impossible to detect without a deeper look. Additional items could be: more broken parts that spill out from the inside of the car (example: front end hit was discovered to have a damaged radiator, only clearly visible after the front bumper and grille are removed), additional damage/denting/twisting/warping of metal parts that require more labor hours to fix, as well as any of the car's ECU's (electronic control modules) requiring diagnostic scans/resets/reprogramming/calibration after a collision. Increased part prices are also common as auto manufacturers routinely raise their prices. After the initial evaluation, the car is dropped off at the repair shop to get fixed, and the vehicle is disassembled for a thorough analysis of what happened during the collision, and what steps need to be taken to return the vehicle to as close to factory-new condition as possible. This is when the estimate will likely be revised to include the additional items discussed in the previous step. In the industry, this is known as a supplement. Essentially, you supplement (or add on) the original estimate with the additional items that need to be addressed. Important: The total cost of the repair almost always will rise to reflect the difference. Note: On some occasions, the final price may actually be lower than the initial estimate, if some items ended up not being needed or if part prices have since been lowered; we call these negative supplements, which are rare, but do occur. Once all the damage is thoroughly evaluated, a final price figure can then be put together. More physical damage simply needs more time to fix. Also consider that these damages also need to be treated for corrosion, and exterior panels need full blown refinishing (repainting) to make it look perfect again. The time required to address the additional damage could be anywhere from 1 or 2 extra days, to another week. Every case is different and requires a tailored approach, but typically, things like straightening bent metal, correcting frame damage, and other such items don't take much time at all and should only change the timeline by a day or two. Parts! Parts are usually the #1 bottleneck causing issue, not just for auto repair, but anything in any industry. If you take a bumper off and find that the bumper reinforcement is completely bent out of a shape (an item that must be replaced and should not ever be repaired), but the reinforcement will take 3-4 days to get, then the repair timeline just got stretched by 3-4 days. Unfortunately, this isn't an item that you know is damaged from the onset of the repair, it's hidden beneath layers of body work. Unless you're Superman and you have X-ray vision, you have to accept the changing circumstances and do your best to expedite the repair to make up for the lost time. Paperwork processing delays. If an insurance company is paying for the repairs, chances are your claim adjuster is inundated with hundreds of claims that they need to process, so waiting for their approval for the additional damages could understandably take some time; there's only so much one person can do, therefor we try to present them with a neat, organized package to make their lives a little easier and move the repair along in a timely fashion. The practice of evaluating damage is increasingly difficult as cars become more and more complex. The introduction of Advanced Driver Assist Systems such as speed-sensing radar, lane departure warning systems, collision preventing auto braking systems, and much much more, cause repair complexity and overall severity to increase, which makes having a perfect initial estimate that much more difficult. The goal is to minimize supplements as much as possible, but sometime they're unavoidable. Either way, it's best to have trained and experienced technicians and damage evaluation teams to take care of your car (like us). If there is any indication of where the future of automotive technology is headed, the vehicle showcase at the 2018 Geneva Motor Show shows us that cars and transportation technology is about to make a big leap forward. The long-established internal combustion technologies that made the horse-and-buggy antiquated are now themselves falling by the wayside, as the next generation of propulsion, in the form of efficient and torquey electric motors (and more importantly the batteries that power them), begin to prove themselves. Automakers have made no secret of the fact that they are slowly moving away from traditional gasoline and diesel burning cars. A combination of energy efficiency, government-regulated emission standards, and changing consumer tastes have ramped up the development of electric cars. Nearly all major automakers have committed billions of dollars to electric vehicle development, and by the middle of the next decade, most new cars released for sale will either be fully electric, or an advanced hybrid system that relies mostly on the electric motor. Electric motors and electric vehicles are not new; the technology has existed for well over a century, so why you may ask, are electric vehicles suddenly becoming so popular? The answer is battery technology. Recent advances in battery technology have led to batteries that have higher charge density, as well as faster discharge rates, meaning you don't have to plug your car in every 20 miles, or be permanently stuck in the slow lane because your car doesn't go faster than 40 miles per hour. You can chalk up the explanation to this: people will not compromise their gasoline cars for something that's slower and travels fewer miles. The electric car not only has to be as good as a gasoline car, it has to be better than a gasoline car, in order to convince people to switch, and we are finally beginning to reach that tipping point, hence the proliferation of electric vehicles that we're beginning to see. In addition to what drives the car, this year's Geneva showed us what are known as ADAS, or Advanced Driver Assist Systems. ADAS exists in some forms on vehicles currently on the road: lane departure warning, automatic braking, blind spot monitors, Tesla's "AutoPilot", and other similar systems, today found mostly as optional or luxury extras, will soon become standard on all new vehicles. The pinnacle of ADAS will be full automation, where the car will drive itself. We are only a few years away from that being a reality, and there will soon be a day when driving your own vehicle will be a rarity. One thing not lacking this year at Geneva: beautiful cars. Automakers can't seem to produce enough downright stunning vehicles. We suppose that given the extreme competitiveness of the automobile market, companies just cannot get away with making ugly cars anymore, so although we may one day lose the visceral appeal of a roaring combustion engine, we seem to be regaining the visual artistry that once dominated automotive design. If you've been involved in a car accident, or have incurred damage to your property, there is a likelihood that you might need to use either your insurance policy, or the policy of someone who caused damage to your property, to pay for the repairs. The insurance company however will not cover the entire cost of the repair, only a portion of it. So who pays the rest? You may have to. Your portion of the cost is known as your deductible, and we will be discussing different types of deductibles today, as well as when and if they apply to you. ​If your car repairs are going to be paid for by an insurance company, there are two types of claims your particular claim can be categorized as. The first is a collision claim, and as the name suggest, means a car was wrecked, particularly due to human error. Scenarios that would qualify as a collision claims include: you wrecking your car by driving into a stationary object; you wrecking your car by hitting someone else's car; lastly, your car being wrecked by someone else hitting your car. The second type of claim is a comprehensive claim. These claims include damages to your car caused by events other than collisions. Acts of nature such as fire, hail, flooding, or wind, which cause damage to your car, are considered comprehensive claims. Vandalism of your car, or theft, are also considered comprehensive claims. Essentially, if the car was damaged in a way not caused by an outright collision is considered comprehensive. A common type of comprehensive claim that we see is wind causing a tree to fall onto a car. A deductible can be thought of as a copay, same as when you visit your doctor. You pay the doctor a relatively small fee upon your visit, and the doctor then bills the remaining charges directly to the insurance company. Please note: Insurance deductibles for auto body repairs are collected by the auto body repair shop at the end of the repair, not up front. An insurance deductible is paid for by the insured, when fixing their own vehicle. A common misconception is that you must pay your deductible, if, say for example, you hit someone else's car and they are claiming the repairs through your insurance policy. Remember, you only pay the deductible when fixing your own car. If someone else is making a claim against your policy, you do not pay your deductible to fix their car, only your car. Depending on your insurance policy, your deductible amount may be different depending on the type of claim. When purchasing your policy, you may have elected to have different deductible amounts for collision and comprehensive. Please check your policy for the exact numbers. Finally, a very common question we are asked is, do I need to pay my deductible is someone else hit my car? The answer is, that it's complicated. This can go two ways: 1) you file an insurance claim for the damages through your insurance company, or 2) you file an insurance claim directly through the insurance company of the person who hit you. If you filed the claim through your insurance company, you will have to pay your deductible, even if the accident was not your fault. However, and this is a big however, once the insurance companies settle on who was at fault, and the insurance company of the person who hit you accepts liability for the damages, they will pay your deductible for you. Your insurance company will collect your deductible from the other person's insurance company. This might happen while the vehicle is still being repaired, which means your deductible will be waived, and you will have nothing to owe upon picking up your car. If the collection process, known as subrogation, takes longer than the repair, then you will have to pay your deductible, but the insurance company will reimburse you later on once the subrogation process is complete. If you filed a claim directly through the other party's insurance policy for an accident that was not your fault, and that person's insurance company accepts fault and liability, then you will not have any deductible to pay. We hope this piece on deductibles helps, as it is a common point of confusion. Remember, if you have any other questions that we have not discussed, you can reach out to us 24/7/365. We are here to help you. Repair Timelines: How Long Will My Repair Take? If your car needs to be in the shop for repairs, you might be wondering how long it will be out for. Your car is your gateway to getting things done, and you need it back as quickly as possible. Whether it's running errands, getting to work, or enjoying leisurely travel, you are stuck without your vehicle, and hope that the auto body repair shop understands your need to have it back sooner rather than later. Today we will discuss repair timelines and how long it will take to have your car returned back to you. ​The big question here is, how severe is the damage? Are we talking about small cosmetic damage, like some scratches or a small dent, or major denting and multiple broken items? How about the extent of the damage? Is the damage isolated to just one panel, or are multiple panels affected? What about the car's different systems (e.g. the body, the mechanical components, the electrical components, etc.)? Is it just body and paint work that we're talking about, or will the repair be more involved than that, including engine work, suspension work, airbags, and electrical/programming work? Lastly, will parts needs to be replaced? If so, are the parts readily available? These are the questions that will dictate the overall turnaround time of the repair. ​Day 1: The vehicle is disassembled to fully identify all existing damage. The repair estimate is finalized. Day 2-3: The dents are straightened and scratches removed from the body. Broken items are replaced. Day 3-4: The affected panels are painted and let to heat-cure. Day 4-5: The vehicle is reassembled and detailed. Final quality checks are made. What if the damage involves more than just cosmetic dents and scratches? What if the damage involves the frame, suspension, engine/transmission, airbags, or other components that are occasionally, but not commonly, damaged. Frame damage: if the frame has been affected in any way, at the very least a thorough measurement must be taken to devise a plan for repair. The measurement process involves clamping the vehicle down on a designated frame measuring machine, and a laser-verification system is used to produce the complete dimensions of the vehicle and how far the car has deviated from where it should be. The measurement process alone will add 1 additional day, and if corrections to the frame need to be made, a second day will be required to do so. Suspension/brake/steering damage: If any of these components are damaged, there is no repairing them, they must be replaced with new parts. This portion of the repair does not take long, typically 1 day, but procuring the parts may take anywhere between 1 day to 1 week, depending on the year, make, and model of the car. Engine/transmission: typically these items are not damaged in a collision, but if they are, will likely be the most involved portion of the repair and can take anywhere from 3 days to 2 weeks to repair. Don't be afraid, very rarely are the engine or transmission damaged during a collision and this will likely not apply to your repair. Airbags/electrical: See suspension/brake/steering section. The same conditions appliy to this section. Next, we consider the extent of the damage. For each additional panel that is damaged, a safe bet is to add another day to the process. Example: damage to one door will take about 4-5 days to repair, but damage to two doors will take about 6-7 days. If the whole side of a car needs to be repaired and repainted, 2 weeks is a safe bet. The big question here is, how much of the car has been damaged? The answer to this will dictate the overall repair timeline. Lastly, we must consider damaged parts that need replacement. This part of the repair can occasionally cause a logjam, where the vehicle is otherwise ready to be repaired, but the parts are not immediately available. Depending on the car, the manufacturer may or may not have the parts on hand and this can extend the repair timeline. Typically, parts that are not immediately available the same day can be procured by the following day, thus a 1-2 day waiting period is common until all the parts have arrived. To ensure a faster repair, we can arrange for parts to be ordered ahead of you dropping off your vehicle for repair, which will shorten the time until you get your car back by at least one day. If you're wondering how long your repair will take, a 5 minute consultation with our staff will answer all the questions you have, but we hope this guide is a good starting point. Every once in a while, we like to put our wrenches down and spend some time relaxing, enjoying time with family and friends, and maybe even going somewhere fun. This journal entry is about one of those "somewhere fun" places. This place is called Angeles Crest Highway, an old, tucked away access-road that cuts right through the middle of the amazing San Gabriel Mountains National Monument. The San Gabriel Mountains are a massive series of mountain ranges that span the northeast of Los Angeles, and they contain within them a forest wonderland that offers any recreational activity you could possibly want: hiking, fishing, biking, swimming, skiing, bungee jumping, observatory telescope viewing, and even coffee. But, there is one activity that ties all of those things together, and some might even consider it the best activity of all. The 2 East, also known as Angeles Crest Highway, provides both driving thrills and access to noted destinations in the mountains. The mountain pass provides roughly 60 miles of windy, sweeping roads with incredible mountain vistas and breathtaking panoramic views of the LA basin. For the motoring enthusiast, this is where you come to exercise your car, pushing the accelerator and climbing the elevation all while passing ancient forests and volcanic remnants of the past. The long road leads you to other lost destinations that are hidden within the mountains. About 15 miles in, a road branches off from the main highway. The road itself is an exhilarating driving course that will see the road surface narrow dramatically, and the twists in the road becoming much more abrupt. This is Mt. Wilson road, a 7 mile stretch shrouded under mammoth pine trees that will lead you to the storied Mt. Wilson Observatory, a once cutting edge scientific research facility that the likes of Albert Einstein have visited. Fun tip: you can reserve the observatory for viewings on their website. Keep going on the main highway though and you will quickly notice the air temperature changing. You are really climbing now and the landscape changes. Suddenly the density of trees rises, and they are greener and more lush. The mountains in the distance are bigger the deeper we push into the San Gabriels. At this point you might be feeling hungry, or thirsty. About 30 miles into the mountains, you will find a tucked away cottage that is famous to motoring enthusiasts as the Sunday meet-up spot to park their vehicles and hang out under the trees. 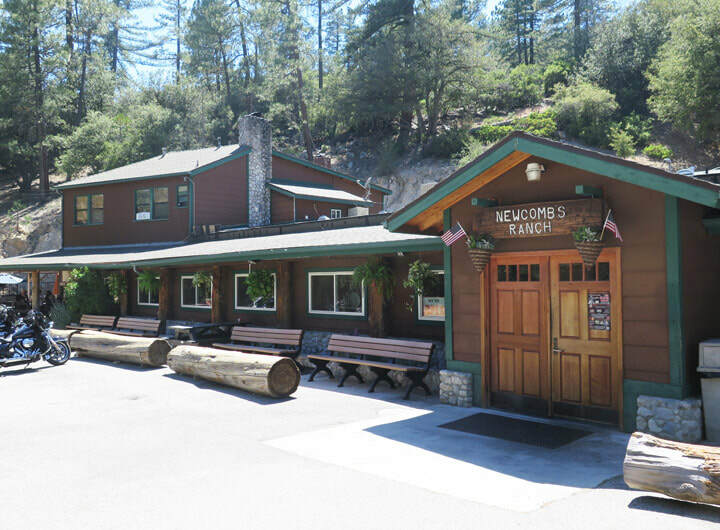 Newcomb's Ranch is the name. What formerly used to be an actual working ranch back in the frontier days of the wild west is now a restaurant that serves up breakfast and lunch for the intrepid mountain adventurer. ​Beyond Newcomb's Ranch lies territory that few venture to. The elevation keeps going up and the scenery only becomes more beautiful. If you come in the winter, you might find yourself in a winter wonderland, a picturesque scene of snow covered pines and wildlife in the background. The mountain sports two separate ski areas that are open depending on weather conditions, but are just another notch in the belt of this amazing place. Animals that you could not have possibly imagined living an hour outside of Downtown Los Angeles call this place home. Bears, mountain lions, coyotes, and even bighorn mountain sheep (the LA Rams name totally fits). Do not be afraid, they are rarely seen and keep to themselves, but always be careful. Keep pushing and you will find yourself at the base of the tallest mountain in all of California, Mt. San Antonio, but colloquially known as Mt. Baldy. Towards the end of the road, you will start coming back down to sea level and ask yourself if you just traveled through a time portal, a road that just took you to another time and place, and the answer to that is yes, yes you did. What was once a commonly visited mountain retreat is a now a semi-forgotten destination for only the most daring, but it should not be seen that way. Angeles Crest and the San Gabriel Mountains are still a destination not to be missed by both Los Angeles natives and visitors alike. Skip the celebrity sight-seeing tours and come here instead, you will be glad you did. Car Rental: Everything you need to know about renting a car during your repair. Your car was involved in a collision and now you need to have it repaired, but having it repaired means you will be without your car for a period of time while it's in the shop. Just because your car is unavailable to use does not mean you can stop running errands, or stop going to work or school, and it certainly does not mean you have to cancel that road trip you were looking forward to. You still need the use of a car, so what options do you have while your car is being fixed? The need for a rental car is a common request, so we will discuss what options you have to keep your life moving while your car is being fixed. If the repair is being handled under your insurance policy, and you do have rental car coverage on your policy, then your insurance company will pay for the rental, meaning you will not have to pay for the rental* (*barring optional added insurance charges and taxes). The rental car company will, in almost all cases, bill the charges to the insurance company directly; occasionally the rental works on a reimbursement basis, where you will pay for the rental yourself, then submit the invoice to your insurance company for reimbursement. 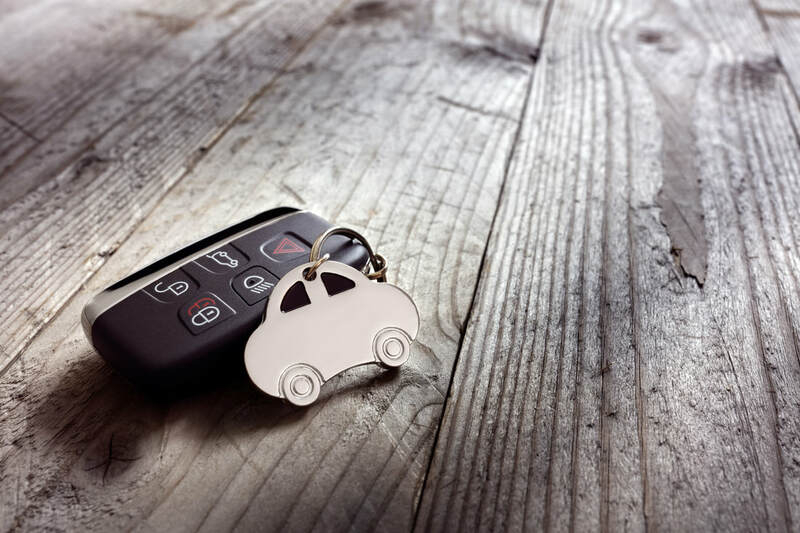 If the repair is being handled under your insurance policy, but you do not have rental car coverage on your policy, then you will need to pay for the rental costs out of your own pocket. If the repair is being handled under another party's insurance policy, for example, the policy of someone who hit you, and their insurance company has admitted fault and accepted liability for the repair, then that person's insurance company will pay for both your vehicle repair and your rental car costs. ​If your repairs are being handled without the involvement of an insurance company, then the rental car costs will be your responsibility, or the responsibility of another party that may have damaged your car. Another question we receive is, how is the rental set up and coordinated? Once you have scheduled a date to drop your vehicle off for repairs, we will contact one of our local rental affiliates (Enterprise, Hertz, etc.) upon your arrival, and their friendly staff will pick you up and take you to their nearby location to choose a vehicle. Please note that if your repair is being handled through an insurance claim, the insurance company may have already set you up with a reservation for a rental from a specific rental car company; if so, please share your reservation information with us and we will correspond with the appropriate rental office. If you need a insurance rental reservation but do not yet have one, please call or email us and we will be happy to set one up for you. Lastly, if you need a specific type of vehicle, please do not hesitate to ask for one. Another common question we hear is, what type of rental cars are available? The short and sweet answer is: any type. Whether you simply need transportation from A to B, or a specific type of car that you need for work, we can arrange it for you. Common requests are: small efficient cars, luxury sedans, large SUV's, and pickup trucks. If you require a specific type of car, please contact us a day or two in advance to guarantee that we will have that vehicle available for you. We hope that this guide answers some questions regarding rental cars, however, if you need further clarification on your specific rental needs, please contact us at any time and we will work with you to get you back on the road quickly. 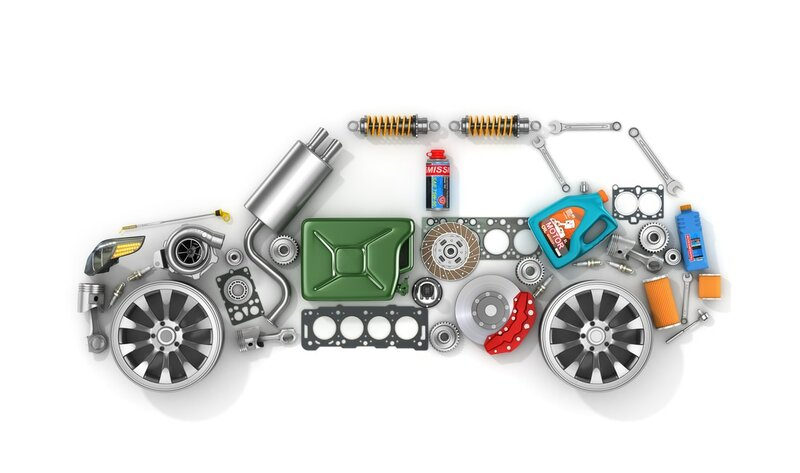 Car Part Types: New Original, Recycled, and Aftermarket. What's the difference? feel the same? If parts need to be replaced, what type of parts will be used? These are all great questions, and the answers to these questions play a role is how your car will look and feel after it has been repaired. Not all parts are created equal, so we will briefly discuss the differences in the parts that will be used to restore your car back to pre-accident condition. ​Parts vary by their origin, their condition, and their availability at the time of repair. Depending on the specific requirements for the vehicle, various different parts may be used to ensure a safe, complete, and efficient repair. The three types of parts available to repairers are new factory original parts (also known as new OEM parts), recycled (or used) OEM parts, and new non-OEM (or aftermarket) parts. New factory original parts (OEM): OEM stands for Original Equipment Manufacturer, and refers to brand new parts that are purchased through dealerships and other select authorized distributors. New OEM parts are, as the name suggests, parts that are designed and manufactured by your vehicle's manufacturer to the original specifications that the car was designed under. These parts are brand new, sourced only from dealers (and a few other distributors), have original part numbers, come with a factory warranty, and match the parts on your vehicle exactly. These are the best possible quality replacement parts you can purchase for your vehicle and are always the first choice of repairers, as their quality, fit and finish are guaranteed. Non-new OEM parts (Recycled): Recycled parts are exactly like new-OEM parts, however they are not brand new items. Recycled parts are parts have been saved from vehicles that were declared a total loss by the insurance company. For example, a Toyota Corolla with front-end damage was deemed a total by the insurance company, but the rear end of the vehicle was untouched; the trunk lid, tail lights, rear bumper, rear doors, and so on, are undamaged and in brand new condition. Those parts that can still be used are removed from the vehicle, carefully packaged and stored, and available for use on another Toyota Corolla. Recycled parts are still original parts, made by the original manufacturer of your car, and identical to the parts on your vehicle. The advantages of using recycled parts as opposed to new OEM parts is that they are much more cost effective, look and performs exactly the same as new OEM parts, and are great for the environment: why take the time, energy and resources to make another new part when there is a perfectly good recycled part ready to be used. All recycled parts employed by us are thoroughly inspected for quality, fit and finish before being selected for use for your repair. Remember, these parts are just as original as dealership parts. New non-OEM parts (Aftermarket): Aftermarket parts are parts manufactured by third party parts makers, namely, not the manufacturer of your vehicle. They are essentially copies of your original parts, but are still new. Any part that is not made by the original manufacturer of your car is considered aftermarket. Common aftermarket items include: bolt on parts like bumpers, lights, fenders, radiators, suspension components, stereo equipment, etc. The benefits of using aftermarket parts are that they are typically more cost effective than OEM parts, look and feel the same as OEM parts, and may be the only option for older vehicles for which new OEM parts no longer exist. Every individual repair requires a unique approach to ensure the vehicle is repaired safely, efficiently, all while taking a zero-compromise standard to work quality. At Victory Auto Body, we elect to use only parts that look, feel, and are of the same quality to the ones that are on your car, and we will not repair a vehicle unless we determine that it will be completely restored to pre-accident condition. Your vehicle will look, feel, and behave the same as you know it. You filed an insurance claim for damage to your car, so what's next? Get a repair estimate for the damage. If you and your car were involved in an accident, or if your car has incurred damage in some way, chances are you have filed a claim with your insurance company to have your car fixed. What does getting an auto body estimate consist of? The estimate process itself is an overall vehicle inspection and damage analysis. Photos of the vehicle (and the damage) are taken, and a report is written that outlines what needs to be done to restore the car back to factory condition. The report consists of an itemized list of all the items on the car that may require replacement or repair, as well as a thorough breakdown of the charges. How long will the estimate process take? We pride ourselves on our customer accommodation and turn-around times. You may arrive at the shop without an appointment, and we will inspect the car within 10 minutes of arrival. If you do not wish to wait for a written report, we will be happy to email you a copy of it. From drive-in to drive-off, the whole process will take no longer than 15 minutes and the estimate itself will be prepared within 24 hours. Who handles the communication with the insurance company? We do. It's as simple as that. We submit the photos of the damage, as well as the repair estimate, to the insurance company for processing. Typically, the files are communicated to the insurance via specific industry software following specific industry guidelines. If there are additional documents and notes required by the insurance adjuster handling your claim, they will reach out to us directly. The last thing you need to do is learn specific uploading procedures; let us take care of it, it's our job. Note: You will be provided with a copy of the estimate as well. After the estimate and photos have been submitted to the insurance, the adjuster handling your claim will review the files, approve of the bill to repair the car, and notify both you and us to proceed with the repair. Note: Depending on the facts of the loss and if liability has already been accepted, you may drop your car off for repair even before the estimate has been written; to verify, please give us a call or email regarding your specific claim, and we will be happy to check that for you. Once the estimate has been submitted, call or email us and we will schedule a drop-off date for repairs that works best for you.